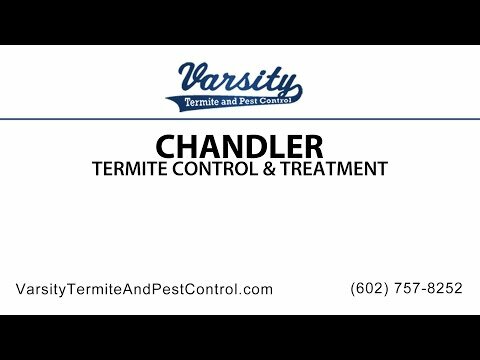 If you have ever experienced termites in Chandler Arizona, you know what a pain they can be. Without the proper care and essential maintenance, they can wreak havoc on your home and cause thousands of dollars worth of damage. To get the proper termite control and termite treatment, you need to see a professional about ridding your home of termites. If you opt to move into a new home, however, there are a few things you can do when you are having your house built that will keep the termites away for a long time, saving you a considerable amount of money. In the United States alone, termites cause approximately $5 billion worth of damage. Although you are not required to treat your home for termites by law, it is still a good idea for your to do so. This will save you a considerable amount of time, energy, and money. Just because it is not part of the law, does not mean you should not get it done. Plus, all lenders require proof that you have treated your home for termites before granting you a loan. Getting your home treated for termites during the construction phase is essential to protecting your house from a horrible infestation by these destructive pests. The first type of treatment you can get for your newly constructed home is a liquid treatment. This kind of treatment requires multiple trips to the site and will create a zone of protection. Your pest control in Chandler will treat areas like soil under the slabs of concrete, and around the piers and foundation of your home. The chemical that is used is a non-repellent so it is undetectable by the termites. This is a highly effective substance. It causes the termites to stop feeding, so they eventually die. They also pass along the pesticide to other colony members so it spreads throughout the termite population around your home. Depending on the type of soil and environmental conditions, this treatment could last for up to ten years. Another popular and effective treatment is wood treatment with borate. Brate is a salt that keeps the termites from tunneling over wood and acts as a toxic ingestive. This salt is applied to a two foot band of structural elements in your home like studs, base plates, and sills. This procedure is performed after the roof is installed and before the plumbing and electrical work can be completed. As long as the wood of your home remains dry, the salt will stay in place and work effectively to reduce and eliminate termite damage. This solution is not applied to soil, so you will also need the liquid treatment if you want to keep the termites away from your foundation as well. Another good treatment to use is the termite baiting system. This is heavily reliant on placing termite bait stations around your home so that when termites are foraging for food, they find the bait instead. “Baiting” can sound misleading, as this system does not attract new termites to your home. It simply utilize a termite’s natural scavenging behavior. Once the termites get ahold of the bait, the active ingredient is a slow one, so it has time to spread throughout the termite colony, bringing death to them all. Bait stations can be placed every ten feet around the home and depending on your pest service, they will do termite inspection yearly so you can be alerted of your termite problem. They should also be replaced annually so they are fresh and ready for when your home is being invaded by the wood eating devils. Knowing what the best kind of termite treatment is for you is the first step you should take when trying to locate a pest service that will treat your home for termites properly. If you don’t want to pay an annual fee to have your termite baiting systems replaced, the liquid treatment is best for you. And in Chandler, there is not much moisture in the air, so you can count on the wood structures of your home to stay dry when considering the wood treatment with borate. If you just want the little buggers gone, then all three would be optimum so you don’t have to worry about them feasting on your home. If you are looking for an excellent Chandler termite control pest service, come to Varsity Termite and Pest Control. With our excellent services, you can rid your home of those annoying termites once and for all. With us, you can rest assured that your home will be termite free. For more information, contact us today!